The session began with a brief introduction and then encouraged participants to introduce an area of focus they would like to discuss. Folk then clustered according to which area they found richest and most relevant to them at that time in order to discuss that topic through the lens of three questions: What is the issue that needs solving? What are potential ways forward? and Who are already working on this? I came with a bioregional hat on and listened out for an area that seemed most relevant to that – I was drawn to a cluster formed by Steve Smith of Edibles a permaculture education and demonstration site in West Yorkshire. Steve wanted to discuss ‘landscape scale land management’. Others who were drawn to form this cluster were Rod Everett of Backsbottom Farm and Middlewood Trust in Lancashire, Mark Walton from Shared Assets and LandExplorer their community mapping software, and David Davies – who I believe is involved with The Green Party in Leicestershire. What is the issue that needs solving? • How to maximise the potential of landscape scale land management to achieve multiple benefits for people and nature? • How to ensure there is community input / engagement in how land is managed? • How to facilitate collaborative decision making as local communities are often not involved in planning and decision making and do not derive benefit from the way in which a lot of land is managed? • How to develop ecological governance on a bioregional scale? • How to define what a bioregional scale landscape is – in a way in which people can identify with? • What is the most appropriate landscape scale for public participation in planning and decision making? • How to develop the potential for local / regional green employment and enterprise development for land management? • What type and level of organisation needs to lead on this? • How to link those involved in enterprise/economic development with environmental focussed organisations? • Convene collaborative planning events bioregionally (or at another more appropriate level) to consider broad scale landscape management. • Working at a city level – seeing a city as a landscape. • Connect up emergency preparedness with business / community / resilience planning. • Use the work of Catchment partnerships and other water / flood management planning processes as a vehicle to develop and expand the conversation regarding landscape management for multiple benefits. Who are already working on this? • Catchment Partnerships – bring together many of the water management and environmental organisations at a catchment scale. Economic development organisations not so involved. Steve brought to the discussion his involvement with landscape scale land management where he lived, including the forthcoming event ‘Our Future Landscapes – Making the most of our moorland‘ a participative workshop tthat will inform the management of the moorland in and around the Holme and Colne Valleys in West Yorkshire and form the basis of a vision and plan for our South Pennine landscape. Listening to Steve talk about that drew me to thinking about the a very bioregional question of what the most appropriate landscape scale for public participation in planning and decision making might be. The moorland landscapes Steve spoke about are a very different scale to the peninsula one I focus on in the Dengie. I was also reminded of David Fleming’s entry for ‘County’ in his book Lean Logic; A Dictionary for the Future and How to Survive It in which he makes the case for the English county as the appropriate scale for balancing effective governance and local participation (while implicitly disfavouring a bioregion approach – see his discussion of the problems of alternatively dividing territory by the ‘characteristics of particular areas’). On the scale of the county, there is a good chance that you can get to the county town and be home in time for supper. Even on a horse. Or, failing that , you can reach your local town which is local enough to sort out the problem and able to make the case at the level of the county. The bioregion is emerging as the most logical and locus and scale for a sustainable, regenerative community to take root and to take place. The bioregion itself can be subdivided – Sale distinguishes between the ecoregion (probably bigger than our Manchester-Mersey bioregion) and smaller, nested georegions (often, as here designated by river catchments or watersheds), and smaller morphoregions – e.g. the Dane valley around Congleton, the Pennine foothills above Rochdale, or the fertile coastal plain between the Ribble estuary and Liverpool. 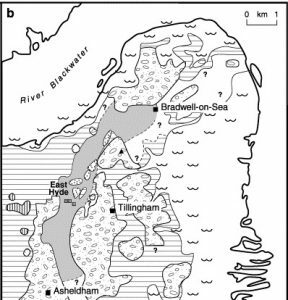 Thinking in this manner I can see the Dengie peninsula as a morphoregion within a larger georegion of the eastern coast (similar to the scope of the ‘terraqueos zone located somewhere between the tidal estuaries of The Humber and Thames’ I suggested might form the ‘English orient’ in Managed Retreat #1). Thanks for the mention of my work from some 10 years ago. You quotation threw up a typo that I hadn’t noticed before: “deigned” should read “designated”. Many thanks James. I’ll take a look at the link you cite. Thanks for this James. I find myself both stimulated and in full agreement with your conclusion that “the right kind of questions are being asked, even if the answers are not yet clear”. More mulling will take place here! Prompted by your thoughts I just ran a search on the text of ‘Lean Logic’ for “bioregion” and was interested to find in the bibliography a 1985 book by Kirkpatrick Sale: ‘Dwellers in the Land: The Bioregional Vision’. Since everything I’ve read by Sale made incredible sense, and David swore by his thinking, I fancy that might provide some useful grist to the mill..